Dustin Ackley has a strikeout problem. It’s not a problem new to him at this level. Last season in the American League, average hitters struck out on 18% of his trips to the plate. Dustin Ackley did so in 21%. However, it was new to him overall. In the minors, Ackley was terrific at avoiding strikeouts. With Tacoma in 2011, Ackley struck out on 12% of his PAs whilst the average PCL hitter would strike out 18% of the time. The low strikeouts in the minors made sense. Ackley was billed as a polished hitter with good contact skills and a good eye for the strike zone. And indeed, Ackley has had fewer swinging strikeouts than average at every level, even including his two years now in the Majors. However, visual evidence is unreliable. Good ol’ fashioned data collection can’t be beat. What I did instead was go through all the pitches captured by pitch F/X that Dustin Ackley has seen as a Major Leaguer, and that the rest of baseball’s left-handed hitters saw as a comparison. Among those pitches, I picked out the ones that fell into the zone that I deemed to be the lefty strike. That location, based on work done by John Walsh and others including my own look, is a square bounded by the same lower and upper limits as the normal strike zone, but starts from the outside edge of the plate and extends five whole inches outside. That is an area that, technically outside the strike zone, still got called a strike just over 75% of the time since the beginning of 2011. In case you were wondering if that percentage was being artificially propped up by pitches right on the black, the slice between the third and fourth inch off the edge of the plate still got a called strike call 70% of the time and between the fourth and fifth inch off the outside edge, it was still 56%. It wasn’t until moving beyond the fifth inch did it drop below 50%. 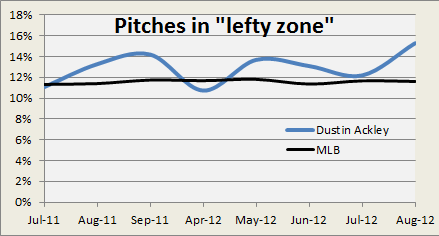 Here’s how often pitches to left-handed batters ended up in that zone. And Ackley refused, or was ignorant of, or whatever, that it was a problem. From those pitches in that five-inch wide quadrant, I also tracked how often they were swung at. Hitters as a group, like pitchers above, displayed a remarkably consistency here. 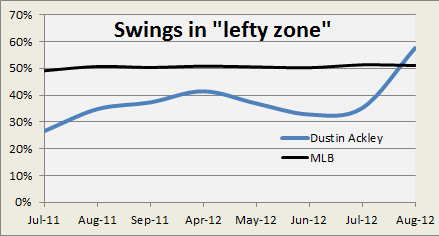 Before August of 2012, Dustin Ackley had breached a 40% swing rate on these lefty zone pitches only once, in April of this year, coincidentally (?) coinciding with when he saw them the least often. And he averaged a swing rate of only 35% compared the Major League average of just over 50%. But now, in August Ackley is swinging at almost 60% of them. It’s a small sample to be sure – the typical month sees about 60 such pitches for Ackley — but the rise is dramatic. Whereas in July Ackley saw 54 pitches in the lefty zone and swung at 19 of them, in August he has seen 63 and swung at 36*. *An earlier version of this post contained inaccurate numbers written above for how many such lefty strikes Ackley has seen. The rates in the graphs were correct, but the totals listed in the paragraph directly above were too high. It may be a fluke and even if not, it may not prove successful – Ackley’s overall batting line isn’t much improved in August – but we may be seeing the first steps of Ackley adjusting to reality that is the Major League called strike zone. We hoped you liked reading Dustin Ackley Might Finally Be Adjusting by Matthew Carruth! Very cool article. Will watch Ackley’s numbers with interest. Seems the next logical step would be to look at his strikeout rate by month to see if there is any effect. Sure enough, his k% is down from ~20-22% to 15%. Taken together with this data it seems that there is some correlation. Unfortunately his BB% has tanked with it from 10% to 3.6%.